The new offerings from BMW have the motorcycle world abuzz. At Touratech, we can’t wait. We’ve broken down the information provided by BMW Motorrad and done a preview of the F750GS and F850GS. There are a lot of great new features on these bikes and many of them are really cool, so check out the videos and let us know if you have any more questions! Touratech will have a full line of accessories for the F750GS and F850GS, so make sure you check out the website! 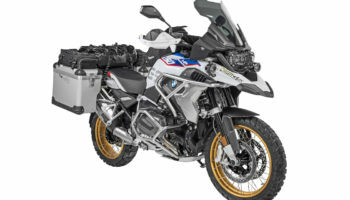 Ian here with TouraTech USA, and around the shop we’re getting pretty excited for BMW to release the F850 and F750 GS bikes. Touratech in Germany is developing a full line of products for the bikes, and so we thought it would be important to go through the giant press release that BMW put out. It’s about 30 pages long, telling you all the things that are new and different on the motorcycle, and we break that down into chunks that were a little easier to digest, and let you know what’s really important about the new bike. So let’s start with what BMW calls the drive system on these new bikes. We’re just gonna call that the engine. It will make it a lot more simple. Bring it into English terms that make a little more sense. So the engine displacement is up from 798 CCs. It’s gone up to 853 CCs. That’s the same displacement for the 850 and the 750 GS. They’re doing that same thing where they have a different naming convention for different power output levels and different bike builds, but the core engine is the same. So, 853 CCs. Power output is up for the 850 GS to 95 horsepower. That’s 10 more horsepower than the F800 GS was producing throughout it’s entire run. The biggest difference, I think, about the new engine is that they’ve changed the crank layout. So this now has a 270 degree crank, whereas the previous generation bike had what was called a flat crank, or 180 degree crank. The big difference there is it’s still a parallel twin, but the firing order works like what a 90 degree V-twin firing order works like. So, if you’ve ever the term big bang engine used, what that means is the two power strokes of the two cylinders are closer together now, with a longer pause, as the rest of the rotations are happening before you can get back to the power stroke of those two cylinders. The important takeaways of that are it should, in theory, make a little bit better traction off road, and two, it’s gonna sound like a V-twin now, which is gonna be pretty awesome. BMW calls it a strong, emotional sound, but it’s gonna sound cool. That’s what’s important. The compression is up. They’ve gone from the 12 to 1 compression to a 12.7 to 1 compression. That’s just giving you more horsepower, as well as helping clean up the emissions a little bit, because you get a more complete burn. The important thing to note in the fine print in that press release, the bike no longer is set up to run on regular fuel. It does have NOx sensors. It can detune itself to run on regular fuel if you’re traveling somewhere, but they actually have a factory option where if you’re gonna be riding the thing a lot in places where there isn’t very good fuel, they’ll actually detune the engine for the computer of the bike and make it so that it’s not running quite as much spark advance so it can run regular fuel. Another thing that’s pretty neat is they’ve changed the entire oiling system to a dry sump system, and that means that the crank shaft and the rods, as they’re all spinning around, they’re not actually slapping into any sitting, puddled oil. The cool thing about the way they did this is the oil tank is still at the bottom of the engine. So, according to the press release, oil change procedures and checking the oil levels should be just the same as it was on the old bike, but it’s scavenging that oil from the bottom of the crank case and it’s injecting it high pressure where it needs to be to keep the engine safe. The clutch system has been changed. BMW calls this a self-amplifying, anti-hopping clutch. And what that means is they basically put a clutch like you can get on a lot of the big KTMs and a lot of the other bigger BMW bikes now where as the torque of the engine is applied to the clutch, it actually makes the clutch press together harder. So that means they can run a lot lighter springs in it. The lever pull is lighter, and also if you’re getting back torque, meaning the engine is compression braking like you just threw a bunch of aggressive downshifts on the pavement and popped the clutch out, the clutch isn’t gonna lock up really hard because it has those lighter springs and the torque system isn’t actually driving it together. Lastly, the engine control is now all fly by wire. So your throttle input is no longer connected to a cable that’s opening the throttle bodies. Now your throttle input is telling the computer how much power you’d like from the bike and the computer on the bike can decide how much power it wants to give you. That’s really, really cool for bikes that have traction control and ride modes and all these different things, because you can totally change the way that the motorcycle responds to your throttle input just based on how you tell the computer you want the bike to ride. The other thing that’s great about that is this enables cruise control, which is now an option for the F850 GS. Touratech is producing a full line of products for these new bikes. So, if you want to learn more, check out our website: touratech-usa.com.